June 3 132 inches, still standing but spathe is beginning to close, light "fragrance"
The spadix has collapsed but the plant remains standing. 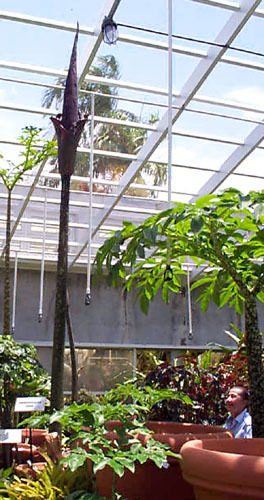 Amorphophallus gigas (formerly A. brooksii) continues to stand in the Windows to the Tropics Conservatory at Fairchild Tropical Botanic Garden, Miami, Florida. We were surprised that the bloom lasted six days. After releasing its trademark stench in waves the "fragrance" became light. The growth rate had been phenomenal at up to 10 inches per day and the plant topped out at 11 feet. It is the first blooming of this species at Fairchild. The tuber was grown from seed acquired with the Amorphophallus titanum seed distributed from the Dr. James Symon & Wilbert Hetterscheid expedition to Sumatra, Indonesia in 1993. The inflorescence emerged from the soil around the1st of May. On Wednesday May 19th, it had grown to 60 inches. The peduncle elongated quickly but the spadix remained hidden until May 22. On May 25 the covering or spathe began to pull away from the spadix. "As the tuber came out of dormancy, I thought this was a new leaf. But by Monday, May 17 it had become obvious (that it was an inflorescence)." Allen received the following message after the news of the pending bloom quickly spread through the international plant community. "Congrats with this excellent result! 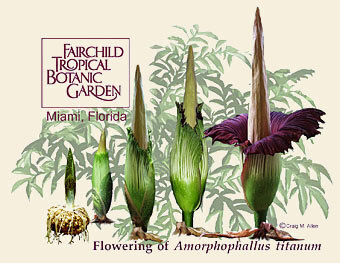 Let's face it, blooming A. titanum is a child's job.........but gigas, THAT is a different story. So far, here at our latitude, it has been extremely difficult to keep gigas alive, let alone get it to bloom, which we've never been able to." Aroideana, Volume 19, 1996, illustrated annual journals by the International Aroid Society, PO Box 43-1853, South Miami, FL 33143 USA. Photos: Craig M. Allen and Suzanne Kores.